053. H.M.S. DISCOVERY. Issued by Brooke Bond Oxo Ltd. (1970, reissued in 1973 with the verso printed in black). 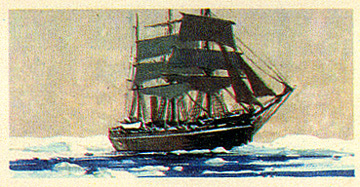 Card number 37 from a set of 50 entitled "The Saga of Ships". Size: Ca. 2.7" x 1.42". Recto: View of the Discovery under sail in icy waters.